Want to enjoy a few minutes with a high content, motivator who will help you leverage optimism to make change work no matter what your age or role, try subscribing to my new podcast, the Pocket Paulson! You’ll enjoy my timely interviews with authors, thought leaders and best-practice leaders. As always, I work to include unique and engaging stories, warm humor and practical insights designed to help transform your attitude and actions into results! Every podcast has a beginning, and Pocket Paulson is no exception. My first interview is with Tyler Maskiewicz, a senior at University City High School in San Diego. Tyler was one of the over 250 youths attending the 2011 Youth Citizen Seminar at Pepperdine University. As a self-proclaimed teenager with old skin, I was one of the presenters, and Tyler was one of the participants that definitely emerged as a leader. It was Tyler and his fellow Rap Group 15 teens who devised the Pocket Paulson as a Free Enterprise Product that won the YCS product competition. It’s all about carrying motivation in your pocket to play a motivating message when you need it. 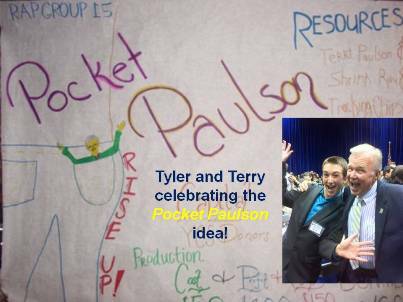 In this podcast, Tyler talked about what he learned from the Youth Citizen Seminar experience, how the Pocket Paulson idea came to be, and his favorite Paulson Keepers he hope to make sure he listens to often. You’ll even hear Tyler do a quick Paulson impersonation to bring the product to life. You won’t want to miss that. What are you waiting for? Download and listen to my first of what I promise will be an engaging series of podcasts! By the way, if you want to remember a few select moments from Dr. Paulson’s YCS program, visit my www.terrypaulson.com website.